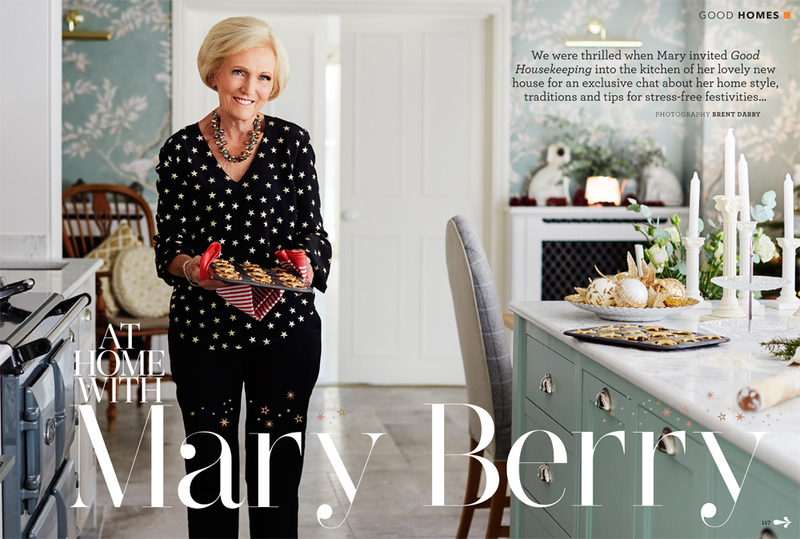 We were bowled over in 2018 to be asked by Mary Berry to create the perfect kitchen for her and her husband for their new home. It was a wonderful opportunity for Guild Anderson and Mary and her team were a complete joy to work with. Nick had a number of meetings with Mary to discuss her requirements including what she prefers to cook on, namely her Aga but also other appliances that she hadn’t used before such as the Quooker hot tap and Miele Contourline cooking oven. The idea was to also have the Miele Mastercool fridge, but sadly the ceilings were just that bit too low to accommodate it, so a Liebherr fridge freezer was chosen instead. These very low ceilings really added to the complexity of the project, Nick wanted to give the cabinetry as much height as possible and with the slim gothic arched de sign that Mary chose he created an elegance to the room, he also kept the design very light with glass shelving in open cabinets and glazed cabinets either side of the Aga all lit internally. Mary wanted a number of areas to be included in her kitchen, the large island directly behind the Aga was to be the main prep area, so all she has to do is turn between one and the other, so there was minimal walking around for her, she also requested a small pretty oak table to be made at the end of the island where she and her husband Paul can sit for breakfast or dine together. She still loves to entertain and adores her large family so Mary needed another table that could easily seat eight to ten, so within the rather beautiful hexagonal extension surrounded by windows but very much attached to the kitchen, the workshop created a bespoke one-off oak starburst pedestal table, this was finished in a white oil which we endlessly checked wouldn’t mark when the grandchildren came to tea. She says in Good Housekeeping ‘ Nick gave us so many great ideas and he designed and made the kitchen for us. Everything was designed specifically for how I use the kitchen, from my wrapping paper drawer to vertical storage for baking trays. The kitchen is all drawers as I didn’t want to have to kneel down and search for things in the backs of cupboards. There are so many little touches that I love too, from my boiling water tap to the concealed lighting.’ Mary is also a great collector of mugs, sitting hens and old-fashioned kitchen utensils (which she has displayed in a large frame on a wall), so Nick made sure that there were plenty of areas where she can display all of her collections. As for the decoration, it all started with a fabulous wallpaper with doves on it from Lewis & Wood. I visited Mary at her previous home to discuss colours and the overall look for her kitchen. This chosen wallpaper set the scene for a colour palette, which was great as it always helps to have a starting point. Mary loves soft colours but wanted to avoid the entire kitchen looking taupe. We picked out Little Greene Aquamarine to feature on the island – a perfect match to her wallpaper and she chose Little Greene Slaked Lime for the other areas of the kitchen. A smaller version of the Doves wallpaper was designed specifically for Mary and this was positioned behind her Aga, with a piece of glass over to protect it, the glass makers had four attempts at installing the glass as it cracked each time as it was so huge. The end result is perfect for Mary and Paul, they now have a room with style and colour but is soft and relaxing for her and her husband to spend time in, it is designed around cooking, but it doesn’t feel functional, it is completely personal to her and she knows that there isn’t another kitchen out there like hers and that is hugely important to us at Guild Anderson. It’s knowing that out our customers feel special and are treated so, and that we deliver the dream they have always wished for.